A series of 18 commercial trials conducted in the Sunraysia and Riverland regions has demonstrated the efficacy of a new systemic insecticide that controls Kelly’s Citrus Thrips in lemons, navel oranges and grapefruit crops. Developed by the innovative crop protection company, Syngenta , Actara will become the ideal insecticide to be specifically registered for the control of Kelly’s Citrus Thrips in Australia. Actara contains thiamethoxam, a second-generation neonicotinoid that controls sucking pests through rapid contact and ingestion. Affected pests cease feeding almost immediately and death occurs by starvation within 24 hours. The active ingredient is rapidly absorbed into foliage, where it provides residual activity against sucking insects. This feature means it poses a low to moderate hazard to beneficial species, making it suitable for use in Integrated Pest Management Programmes (IPM). Jake Prosser of Protec Monitoring Services in Mildura, who carried out some of the trials, said Actara appeared to have great potential in the citrus industry. “Kelly’s Citrus Thrip is one of the toughest and most resilient pests in citrus and citrus growers are keen to find an insecticide that is effective against this pest,” he said. “Fruit scarring is typically found around the calyx area, which produces a “halo” effect known as ring scarring. Thrips also hide between fruit clusters, where they produce scurfing damage. The trials compared the performance of Actara and Supracide, an organophosphate commonly used to control thrips in citrus crops. “Organophosphate compounds are effective for 10 to 14 days but they also control non-target species, which can result in Mealy Bug and Two-Spotted Mite problems later in the season,” Jake Prosser said. Actara was applied at 30gm per 100 litres of water, when the level of damaged fruit reached 3%. Mature trees were sprayed at 4000L/ha. Thrip levels were monitored weekly from petal fall to calyx closure and sprayed as needed with a Silvan air blaster with a Radak conveyor. Jake Prosser said there was a clear difference in the performance of the two products. “Actara was deadly on the thrips and kept working for five to six weeks, whereas Supracide lasted only two to three weeks,” he said. “In practical terms, we only had to apply Actara twice compared to three or four times with Supracide. There were only minimal Mealy Bug and Two-Spotted Mite numbers in the Actara sites, whereas healthy populations of bugs and mites were found in the Supracide sites later in the season. “We also found plenty of beneficial insects in the Actara sites, including Hover Fly, Green and Brown Lacewing, along with their larvae, and a parasitic wasp called Comperiella bifasciata that preys on Red Scale. Jake Prosser said regular and thorough monitoring was crucial to thrip control. “Weekly monitoring must begin from petal fall in about October and continue until after calyx closure in December,” he said. “Examine five to six pieces of fruit per tree from at least 50 trees in a five-hectare block. Look under the calyx of the fruitlets and between clusters. Adult thrips are 2–3mm long with black bodies, legs and wings. Larvae, which cause the most damage, are up to 2mm long, with lemon yellow bodies and are wingless. 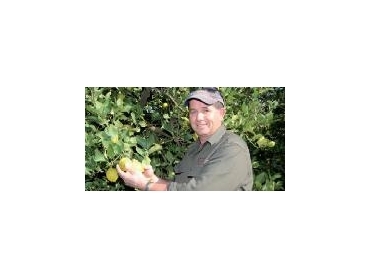 AgriExchange, formerly Yandilla Park, Entomology Manager, Scott Dix, said thrips were a major pest in all citrus crops, particularly navels, lemons and grapefruit. “Thrips have gone from being almost unnoticed 15 years ago to becoming the number one pest in citrus,” he said. “It is believed that the use of broad spectrum insecticides, in line with market demand for blemish-free fruit, may have removed natural predators and parasites from the equation, allowing thrips populations to build up unchecked. “If you leave thrips unchecked at crucial growth stages and do nothing, they can do a huge amount of damage in only a few weeks. “If no control is implemented in a high-pressure year, between 20 and 50 percent of citrus can be discarded at packing due to halo or rind discolouration caused by thrips feeding. Early in the season, juveniles hide under the calyx and feed on the developing fruitlet, causing a distinctive halo (scurfing) ring around the stem. Later in the season as colouring occurs, surface-feeding adults and juveniles can cause creamy/white discoloured blotches on the fruit. Scott Dix said Actara had an enormous role to play in the citrus industry. “There are no known effective biological control agents for thrips, so unfortunately we are reliant on insecticides,” he said. “Until now, the industry has relied very heavily on chlorpyrifos but there is now widespread resistance to this compound in the Riverland and Sunraysia regions. “Normally you wouldn’t want a long residual period in an IPM program but there are no known economically-important biological agents against thrips,” Scott Dix said. “The main beneficial species have been identified as soil-borne mites, although the presence of these mites does not appear to reduce thrips populations to below the economic threshold for spraying. Scott Dix said citrus producers typically applied between two to five sprays per season, depending on the insect pressure and citrus variety. There is particular focus around calyx closure in November and December, when other pest activity may also be high. AgriExchange hosted a replicated trial as part of registration studies for Actara, as well as a commercial demonstration during the 2005/06 season. “We were able to apply significantly lower spray volumes due to its excellent systemic activity yet still achieve the same level of control as Supracide, another insecticide commonly used to control thrips,” Scott Dix said. “We applied Actara at 4,000 L/ha using a low-profile airblast machine, whereas we applied Supracide at 9,000 L/ha using an oscillating boom. In effect, we were able to apply 44 percent of the volume and spray both sides of the row at once.